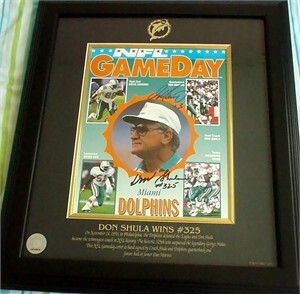 Original program cover from the 1993 Miami Dolphins win at Philadelphia that enabled Don Shula to set the NFL's new career coaching victory record of 325, autographed in black marker by Shula (and he added #325 to his signature) and in blue marker by Dan Marino. Beautifully matted and framed in black and gold, and the matting is laser engraved with the Dolphins logo and the details of this historic game. Ready to hang. With certificate of authenticity from AutographsForSale.com. ONLY ONE AT THIS PRICE AVAILABLE FOR SALE.